Whether or not you decide to add EIFS Inspections to your company’s list of services offered is up to you. Every Inspector had to decide whether or not this is something they believe would help their clients and at the same time, help their bottom line. I was a Certified Professional EIFS Inspector many years in a hot market. I thought this would be a great income stream but as it turned out, it wasn’t. At least not for me, your situation may be different. After I figured in the training, EIFS inspection tools, added marketing expenses and insurance increases, it just wasn’t as profitable as I hoped. So for you new guys and gals thinking about getting into this field, keep these things into consideration before jumping into the EIFS Inspection field. I know guys who say they perform “EIFS Inspections” who used nothing more than an orginal Tramex and a Raytech thermometer. Even after I tell them that the original Tramex does not scan deep enough to find moisture in the substrate, they could have cared less. I cringe when I think of all the homes they “inspected” the EIFS on. In order to do a proper EIFS inspection, you’re going to need some basic tools to get the job done right. There’s no getting around it or taking shortcuts if you want to do a good job. 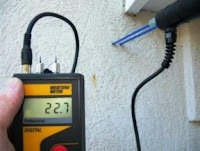 Tramex Wet Wall Detector: This is the Mac Daddy of moisture meters in my opinion. It has two ranges. Low for 1 inch systems and High for thicker systems. This is a non-invasive moisture meter and great for quickly finding trouble spots. This moisture meter isn’t cheap. That’s why you need to be sure your market can support your plans of offering an EIFS inspection service. These meters start at $1000 and go up. You can find used ones on ebay from former Inspectors who tried to offer EIFS inspection services but failed. Invasive Moisture Meters: You have a choice here. These moisture meters will be used to insert holes into the EIFS that you’ve drilled due to potentially high levels of moisture that you’ve located with your Tramex Wet Wall Detector. Your invasive moisture meter will need probes that range from 4 to 6 inches depending on the manufacturer. 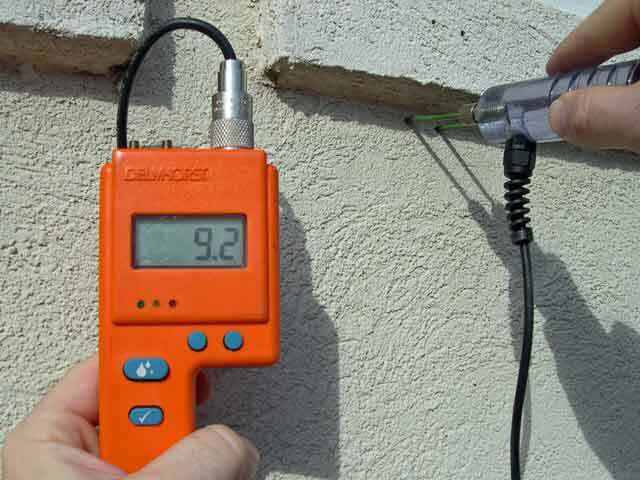 I used a Protimeter Surveymaster EIFS probes during my Inspection years, but Delmhorst also makes a line of great meters with probes for this job as well. Again, these aren’t cheap. Expect to pay in the $500 and up range. Tramex offers both types of moisture meters in their Tramex EIFS Inspection Kit. Worth taking a look at if you’re serious about getting into this line of inspections. Structural Resistance Tester (SRC): This is a tool that measures the structural integrity of the EIFS substrate. I can’t tell you how many times I found dry substrate that was about as structurally sound as tissue paper. If I had went solely on moisture meter readings, I would have never found that large portions of the EIFS was structurally unsound. To use the SRT, you insert it into one of the holes you’ve drilled and start pushing. There’s when/if the probe pushes through the substrate, there’s a needle gauge that will tell you how much pressure it took to push the probe through the substrate. Reporting Software: From what I’ve seen, only a few Inspection Reporting companies have an EIFS version. If you know what you’re doing, you really don’t need stand alone EIFS reporting software, but it can make for a better report, especially if you’re new to this type of inspection. Some companies have EIFS reporting templates you can integrate with the main program, so if you plan on doing this type of inspection, check with the company who makes your reporting software. If you’re just getting into the home inspection business and you think you’ll be doing EIFS inspections, make sure the reporting software you use has an EIFS version. And that’s about all the specialty tools it takes to inspect EIFS. Your best bet at have a successful EIFS training service is to become Certified with one of the companies out there that certify EIFS inspectors. Exterior Design Institute is the one I’m familiar with and (at least in the past) offer some extremely good training. In fact, many experts consider them as the authority in EIFS training and certification. They offer seminars and online training as well. American Wall & Ceiling Institute (AWCI) The AWCI has a very good, in depth training and certification program. In my opinion, every bit as good as EDI’s. Some would say even better do to their requirements one must meet before being considered for the certification program. If you’re a newbie to inspections, you can probably forget about getting this certification because you’ll have to show evidence of actual inspection experience for a few years. Professional Inspector Training Institute offers EIFS inspection training.This is a 1 day class/seminar. National Association of Certified Home Inspectors also offers a course on inspecting EIFS. Personally,I’d recommend both the EDI and AWCI certification if you’re wanting to be considered a true professional in the EIFS inspection industry. Also, finding another EIFS inspector and learning the ropes is a good idea. Even you have to travel a state or two away and spend some time with them. EDI has a list of Certified EIFS Inspectors on their website. Check them out and call a few before jumping into this specialized inspection field. It just might save you some money and heart ache on down the road!